A stylish and sophisticated getaway for just two lucky people. Right on the edge of the Sassafras Village, the Blackwood offers luxury and privacy, but all within a few minutes of great coffee and cake! Fitted with the latest technology, surround sound music, Foxtel, large TV, gas log fire, fully airconditioned, Wifi, Coffee machine. Pure indulgence. 2 night minimums weekends please. 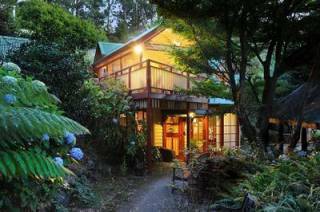 The Blackwood - A luxury mountain hideaway in the picturesque township of Sassafras in Melbourne's Dandenong Ranges. 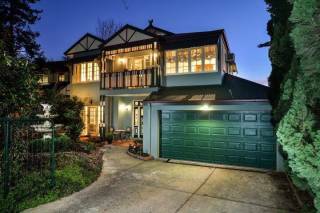 Situated in the heart of the Sassafras village, yet hidden in a private location overlooking the Sassafras Creek Gully, The Blackwood is a haven from city life. This elegant one bedroom villa combines a superb, classically designed interior with state of the art technology. Superb classically designed interior by Melbourne designer, Justin Bishop. The Blackwood is in a quiet, private location but is less than a minutes walk from shops, cafes and restaurants in Sassafras. Cooked breakfast can be delivered to your door at $28 pp ($56 pc), chosen from a special menu. This option must be chosen when making your booking. 5, 6 & 7 day packages which include continental breakfast for first 2 days are available. Please check our Rates page. Single Frid or Sun when available $340. No single Saturday nights thank you. This cottage is just for 2 on the edge of Sassafras village. 50% deposit is required to secure your booking. The balance is payable 14 days prior to your stay thank you. Minibar items are charged to your credit card post your stay. A $75 cancellation fee is charged on all changed or cancelled bookings. Refunds are not given, however a coupon for the value of the monies paid less the $75 cancellation fee will be given. Coupons are valid for bookings up to 12 months in advance, but need to be booked within 6 months of issue of the coupon. Failure to arrive means that your full payment is lost - we'd rather you stayed! please see our www.candlelightmountainretreats.com.au website for directions and a google map to lead you to reception.